Home | Marin Ballet Spring Showcase Tickets for Marin Mommies Readers! Marin Ballet Spring Showcase Tickets for Marin Mommies Readers! Join Marin Ballet for its 2016 Spring Showcase performances this weekend! Come support and applaud dancers from level 1 through 9 (ages 7 to 18). Performances showcase students from levels 1 to 4 (ages 7 to 10) and include a student choreography piece from a level 9 student, a piece from our beginning boys class, as well as solo excerpts from two graduating seniors. Performances are recommended for families and children ages 3 to 8 years old and are approximately 30 minutes long, with no intermission. Information about summer classes will also be available at the performances. Marin Ballet has reserved 20 complimentary tickets for Marin Mommies readers for their Spring Showcase performances Saturday, May 21 at 1 pm and 20 tickets for the Sunday, May 22 performance at 1 pm. We'll give away the tickets on a first-come, first-served basis until they run out! To claim your tickets, send an email to contests@marinmommies.com with "Marin Ballet" as the subject along with your name, the number of tickets you'd like (maximum 4 per person), and which performance you'd like to attend in the body. Ticket winners will be notified via email by Friday, May 20. Performances are held at Marin Ballet, 100 Elm Street, San Rafael 94901 (near Dominican University of California). Complimentary parking is available in Marin Ballet's back lot, adjacent to the Trinity Community Church. Please arrive at least 15 minutes prior to the performance in order to leave enough time for parking and seating. 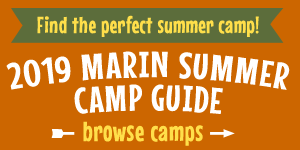 For more information on Marin Ballet and their performances and programs, visit www.marinballet.org.